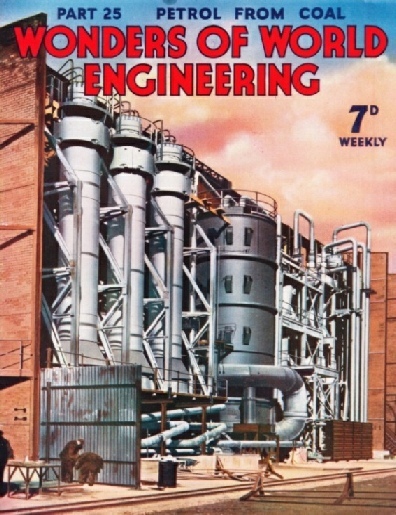 Part 25 of Wonders of World Engineering was published on Tuesday 17th August 1937, price 7d. Part 25 includes a colour plate showing converters used in the hydrogenation of coal. It formed part of the article on Petrol from Coal. The colour plate was also used as the cover design for this part. The cover of this week’s Part is reproduced as a colour plate. 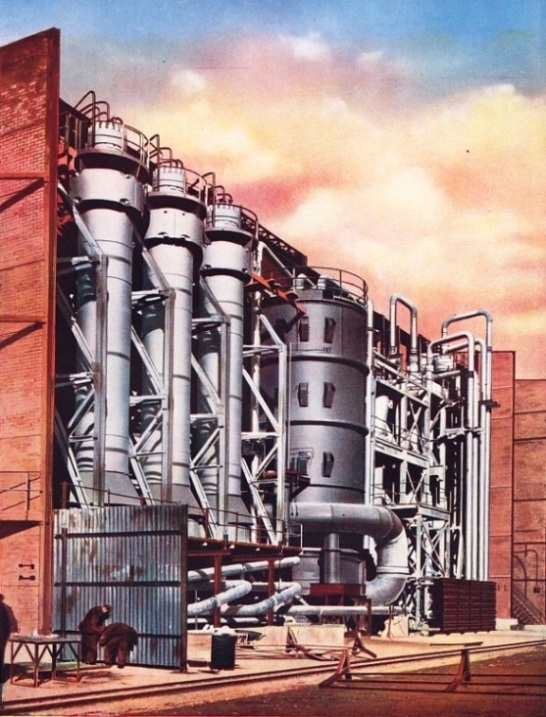 Made from a photograph supplied by Imperial Chemical Industries Limited, the cover shows the high-pressure vessels known as converters, at Billingham, Co. Durham. In these huge forged steel vessels coal is hydrogenated to effect the extraction of oil, as described in the chapter Petrol from Coal which begins on page 727. The great work of the reclamation of the Pontine Marshes, by C Hamilton Ellis. This chapter is concluded from part 24. Investigations of great importance are carried out at the National Physical Laboratory at Teddington, Middlesex. Bridge builders, road engineers, aircraft designers and architects are all assisted by data patiently collected by the research worker. When enormously high temperatures and pressures are employed in such processes as the hydrogenation of coal, the greatest care must be taken that these forces should be completely under control. It is nearly always steel or some other metal which has to stand up to these terrific stresses, and the strength of such metals must be adequately investigated and tested before they are put into use. The Engineering Department of the National Physical Laboratory frequently investigates the properties of materials for unusual conditions, and this chapter, by L H Thomas, describes the ways in which strength of metals is measured, and also how many other important investigations and tests are carried out. The work of the Engineering Department is extremely varied, and during 1936, for instance, some thirty-seven important items of research were in active progress, including experiments to determine the effect of wind pressure on buildings and bridges and the effect of wheel impact on roads and vehicles. 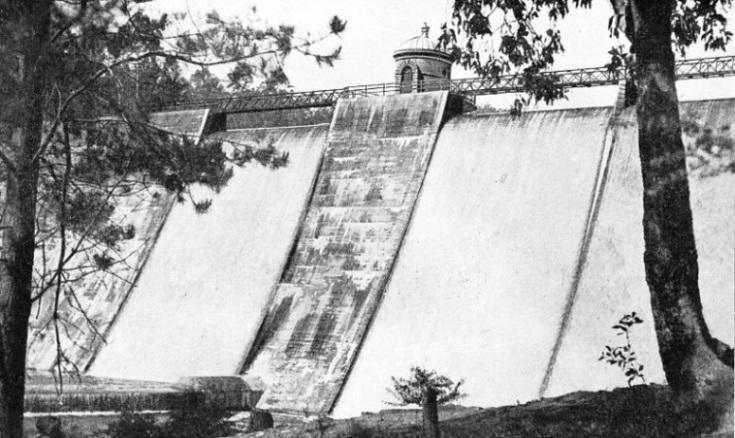 MUNDARING WEIR was built across the Helena River about twenty-eight miles from Perth, the capital of Western Australia, to form a reservoir for the supply of water to the Kalgoorlie district. Eight pumping stations force the water along the pipe line to the goldfield area. The extraction of petrol from coal by the hydrogenation process requires extremely high temperatures and pressures. The enormous plant at Billingham, Co. Durham, is the outcome of years of intensive research in this new and important industry. Some people are of the opinion that the motive power of the future will be derived almost entirely from the use of oil as fuel, as distinct from the use of coal. The growth of oil engines and internal combustion engines in this century has indeed been so remarkable that the present state of the coal industry can be partly attributed to the fact that more and more marine engines and other forms of transport engines are drive by steam from oil-fired boilers. Ships of the Royal Navy, for instance, have been burning oil almost exclusively for several years. The difficult question arises as to where, in emergencies, will ships of the Home Fleet get their supplies when Great Britain is so rich in coal deposits but so lacking in natural resources of oil. Many people have great faith in the possibility of supplies of petrol, for instance, being extracted from coal, and in recent years much experiment and research on these lines have been carried out. There are certain people who give little encouragement or hope to the engineers who are sponsoring these researches, but there can be no question of the success of the enormous plant which Imperial Chemical Industries Limited is working at Billingham, County Durham. A large quantity of benzole motor spirit is produced in British gasworks every year, and several squadrons of the Royal Air Force are operating on petrol made from British coal by the low temperature carbonization process. 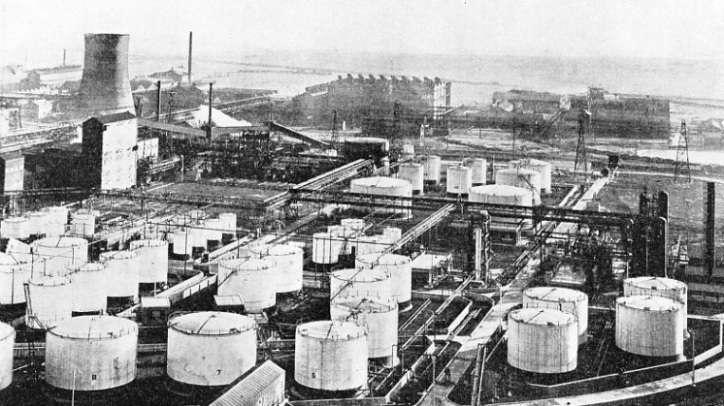 At Billingham petrol is extracted from the coal by what is known as the hydrogenation process. It is a remarkable process, and is carried out in extremely high pressures and temperatures. The process is described in this chapter by Rolt Hammond. This is the seventh article in the series on the Romance of Industry. ELECTRIC FURNACES for determining the creep of metals at high temperatures. Steel bars are placed in these furnaces and subjected to a constant tensile stress, at temperatures of up to 800°C, for long periods. The changes in length of the steel bars are measured by instruments known as extensometers, and readings are taken by observing the reflection of an illuminated scale in a telescope. The apparatus used will detect a change of length of one-millionth of an inch in a steel bar five inches long. 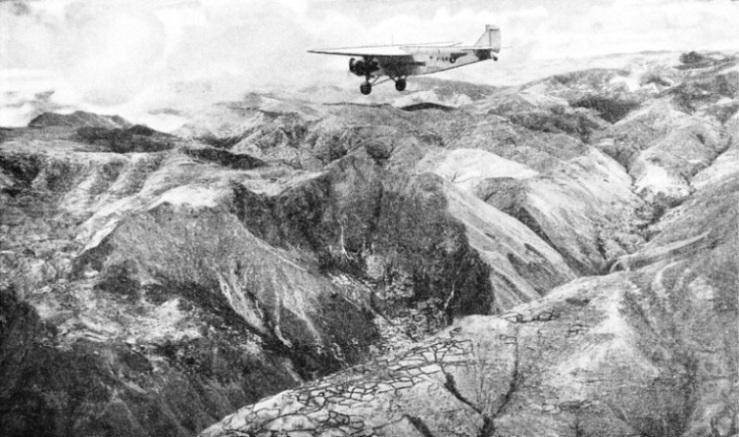 ACROSS THE ANDES the whole of the equipment of a gold mine at Progresso, south-west of Cuzco, Peru, was transported by air. This form of transport is invaluable for mining engineers in a mountainous country such as Peru. Pumped through a great pipe line, water for the gold-bearing district of Kalgoorlie is brought across parched land from a reservoir in the Darling Range, 350 miles away. When gold was first discovered in the neighbourhood of Kalgoorlie, Western Australia, the early gold diggers suffered severely from the lack of good water. It was not until January 1903 that Kalgoorlie had a regular water supply, derived from a range of mountains about 350 miles away from the town. A reservoir was formed by building a huge concrete overflow weir across the Helena River. The water, which was pumped through what was formerly wilderness, now maintains farms, towns and mines hundreds of miles away from the source of supply. This achievement ranks among the most remarkable in the history of Australian engineering, and is described in this chapter by Sidney Howard. This is the seventh article in the series on Triumphs of Irrigation. REMINISCENT OF NORTH AFRICA, this scene in the heart of the Pontine Marshes shows the great change that has taken place in the whole character of the region. 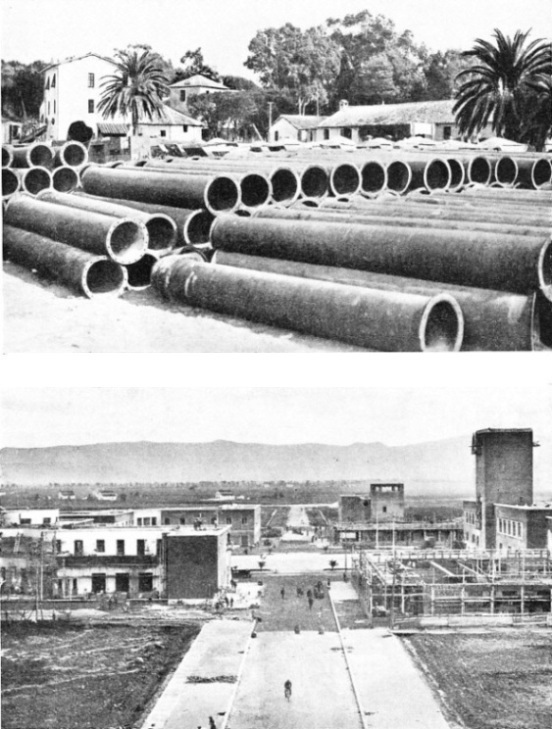 The pipes are used for water supply, which was a serious though paradoxical problem, in view of the swampy nature of the area. Every house and farm in the area is provided with a tubular or artesian well. PONTINIA, one of the four towns which have been built on land reclaimed from the marshes, in an early stage of its development. It was founded on December 19, 1934, and its inauguration took place on December 18, 1935. The town is less than a mile from the Appian Way. 4-6-0 type, the King Arthurs and the Lord Nelsons. The largest Southern Railway 4-6-0s are four-cylinder simple engines of the Lord Nelson class, named after famous admirals. No. 850 Lord Nelson, which appeared in 1926, was followed by fifteen similar locomotives, numbered 851-865. In 1937 No. 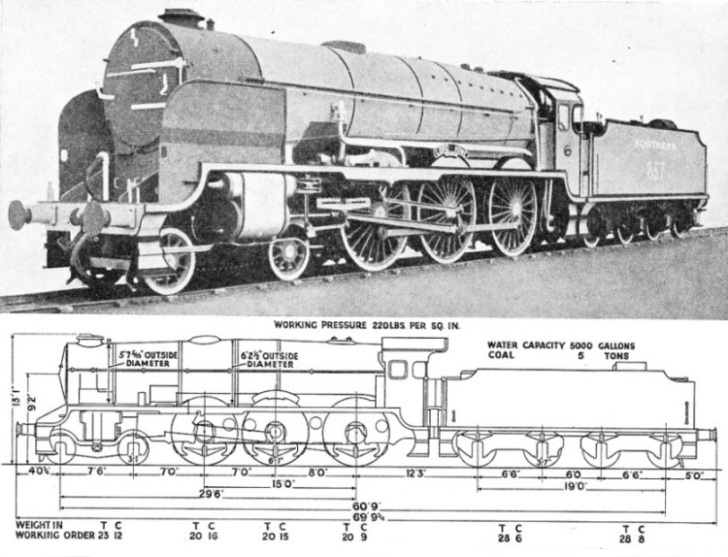 857 Lord Howe - illustrated below - was rebuilt with an enlarged boiler having a round-topped firebox. 2 in) has consequently been reduced to 979 square feet. The total heating surface - 2,313 square feet, including superheater - is slightly less than before. A round-topped firebox has displaced the Belpaire firebox. The boiler pressure and cylinder dimensions (16½ in diameter by 26 in stroke) remain unaltered. This is the fifteenth article in the series on Modern Engineering Practice. Information otherwise inaccessible to mining engineers can be obtained by the use of aircraft for surveying, and amazingly accurate deductions can now be made from a co-ordinated series of aerial photographs. Aerial photography and surveying is particularly useful for mining engineers who wish to develop a promising area, and this chapter describes how aerial surveys are carried out in specially equipped machines, with particular reference to the value of aircraft to mining engineers. The article is concluded in part 26. An entirely new technique for handling telegrams has been devised and perfected in recent years to ensure the highest possible speed and accuracy at every stage in their dispatch and delivery. 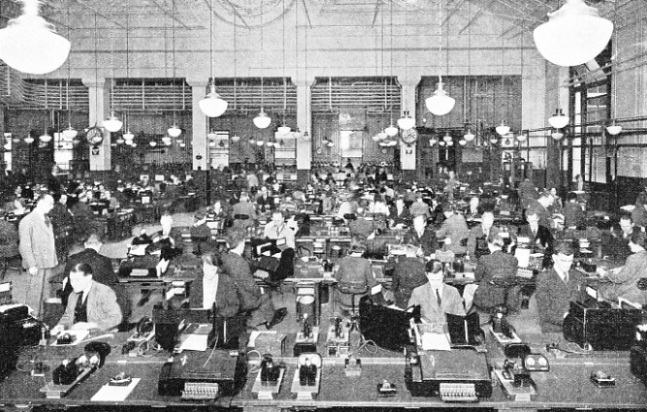 This chapter, written by Howard Barry, describes the Central Telegraph Office in London. As recently as 1929 there were five types of telegraphy in use, but now all these systems have been superseded for inland work by the teleprinter, an ingenious machine which Howard Barry describes. 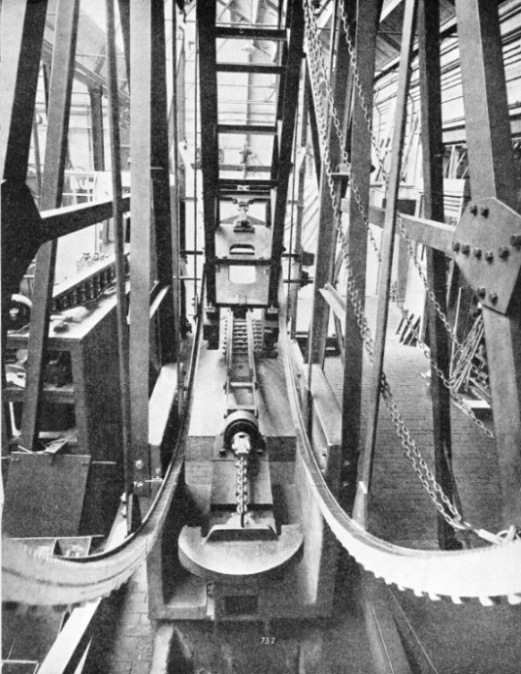 GENERAL VIEW OF THE CENTRE GALLERY of the Central Telegraph office, London, showing how the instrument tables are arranged. The machines in the foreground are teleprinters; in the background may be seen part of the great network of pneumatic tube conveyers which carry messages to and from many Post Offices in the London district. HIGH-PRESSURE VESSELS, known as converters, which are used in the hydrogenation of coal. These vessels have to withstand high temperature as well as high pressure, and are forged from ingots of steel weighing more than 150 tons. The completed vessels work at a pressure of some 3,750 lb per sq in, but were tested at pressures 50 per cent in excess of this. The high test pressures were applied hydraulically, strains and stresses being carefully measured to see that no permanent distortion took place. STORAGE TANKS at Billingham, Co. Durham, for the storage of finished petrol and of oils used in intermediate stages of the hydrogenation process. The tanks are painted with a special paint to reflect the heat of the sun and so reduce to a minimum the risk of expansion or explosion. 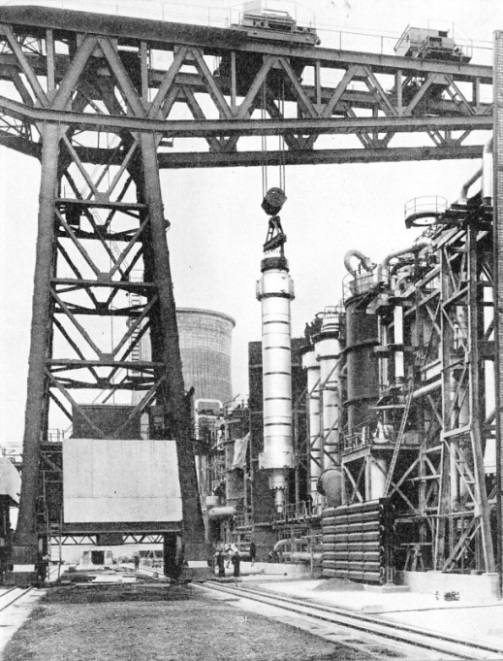 LIFTING A CONVERTER INTO POSITION at Billingham. A Titan crane with a capacity of 170 tons is used for handling equipment in the hydrogenation plant. The huge converter is a simple barrel forging closed at the ends by special joints sealed automatically by the pressure of the gas. 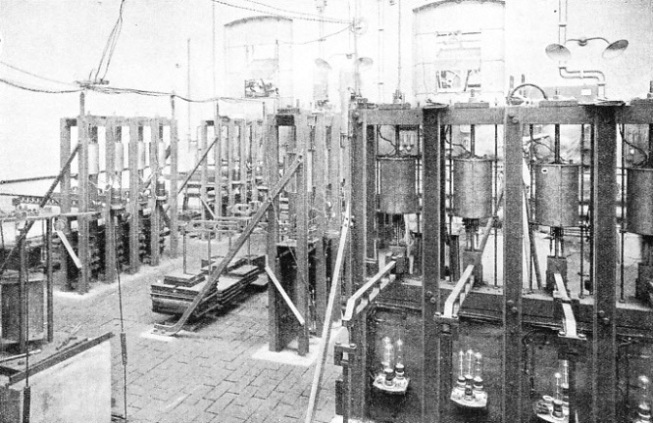 THE GREAT IMPACT TESTING MACHINE in the Engineering Department of the National Physical Laboratory. In the foreground is a chain which is to be tested. The weight or hammer is in the background, partly raised. It falls with a force of twenty foot-tons on the semicircular arm to which the chain is attached, subjecting the chain to a sudden tensional stress.